Last Saturday, French Prime Minister Jean-Marc Ayrault and his wife Brigitte visited LMU Munich. The guests were welcomed by Dr. Wolfgang Heubisch, the Bavarian Minister for Science, Research and the Arts, and Professor Beate Kellner, LMU Vice-President for Research. They also paid a visit to the DenkStätte Weiße Rose, where they were greeted by Dr. Hildegard Kronawitter and Professor Wolfgang Huber, Co-Chairs of the White Rose Foundation. Professor Huber is the son of Professor Kurt Huber, a leading member of the White Rose who was executed in 1943. 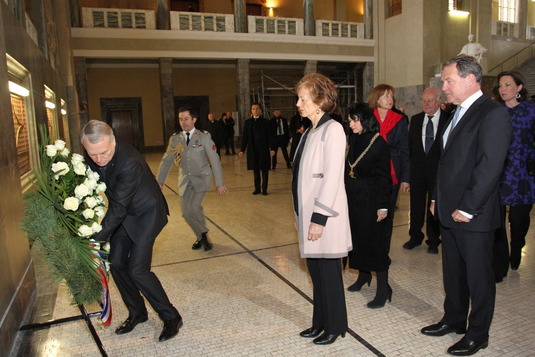 M. Ayrault laid a wreath at the memorial dedicated to the members of the resistance group in the Atrium of LMU’s Main Building. He also presented to the representatives of the Foundation a new French translation of the texts of the White Rose leaflets, which was commissioned from Philippe Noble by the Institut français.